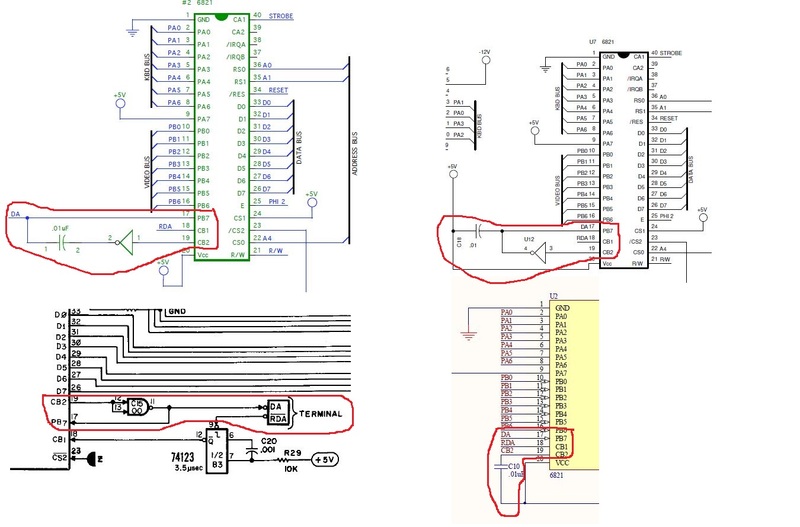 I'm trying to figure out whats the purpose of a NOT gate that's connected on pin CB2 of the 6821. In Tom Owad schematic this gate is connected to pin CB2 and then coupled with a capacitor to pin PB7 which is DA. To me this is useless because the cap will filter the output of the gate. On Briel's schematic the output of the gate is directly connected to the DA signal which I'm guessing both CB2 and DA are outputs and may probably create a logic contention. In the R1 plus the gate disapeared and instead there is capacitor connected from CB2 to ground. The original schematic is more similar to Briel's schematic but it shows that CB2 is an output and PB7 is an input which makes more sense. Re: Apple 1 Replica What's the purpose of this NOT gate on CB2? the data at Port B to contain valid Data. The data port is being used as both input on bit 7 (terminal output ready to accept data) and the character data on bits 0-6. NOTE: this code is backwards from section III of the Apple 1 Operations Manual (BPL vs BMI). It could be that Woz didn't have this NOT gate there originally to bit 7. That might explain why there is a discrepancy between the actual ROM code and the description in the manual. It doesn't appear there is an logical benefit to inverting the signal on bit 7 of the data port (DA to the terminal appears to want it inverted). Maybe it was one of those "Woz-isms". And adding the cap could also delay/clean up the reading of the the DA value.